After seven years running as an NFL partner, Marriott International has to keep that relationship fresh for consumers as each new season gets underway. This season the brand is strategizing off insights that NFL fans are always on the hunt for unrivaled experiences to engage with their favorite players and teams. A view of the custom built Courtyard Super Bowl suite within U.S. Bank Stadium. The Sleepover contest winner gets a night in the suite. It is reprising its popular Courtyard by Marriott’s Super Bowl Sleepover Contest, but with a twist. It is staging a virtual experience of the grand prize—a field-level suite at the stadium that will be transformed into a Courtyard guest room for an overnight stay—through a fully customized 4D virtual reality dome to be displayed Sept. 28, in New York’s Flatiron District. 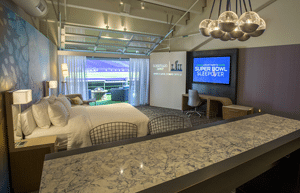 The virtual hotel experience will be combined within a 360° public experience where visitors will feel like they are standing on the field at the Super Bowl stadium. The dome is outfitted with immersive virtual reality programming, with content running floor to ceiling in the dome, that will make visitors feel like they are truly in the experience. “We know NFL fans value epic experiences that bring them closer to the game,” says Karin Timpone, global marketing officer for Marriott International. The contest winner and a guest receive a night of “awe-inspiring, in-stadium experiences” and access to exclusive events throughout the weekend, including tickets to Super Bowl LII. Players enter the contest by sharing their one-of-a-kind NFL fan photos via Facebook, Twitter or Instagram using the hashtag #CourtyardSuperBowlContest. The contest ends Nov. 3. Also this season, Marriott is again collaborating with NFL Insider Adam Schefter. Loyalty members can bid on chance to have a weekly phone call with Schefter throughout the season. With NFL games returning to London and Mexico City this year, Courtyard is expanding its NFL experiences by launching a Super Bowl contest in Mexico with the grand prize a chance to win a trip to Super Bowl LII.